Ensuring a humane, respectful end to an animal’s life is just as important as giving them a healthy life, according to the growing number of people who believe a healthy animal means healthy meat. Springhouse farmer Debbie Irvine is one of many producers who raise animals for meat and have chosen Kam Lake View Meats in Cherry Creek, BC for that very reason. 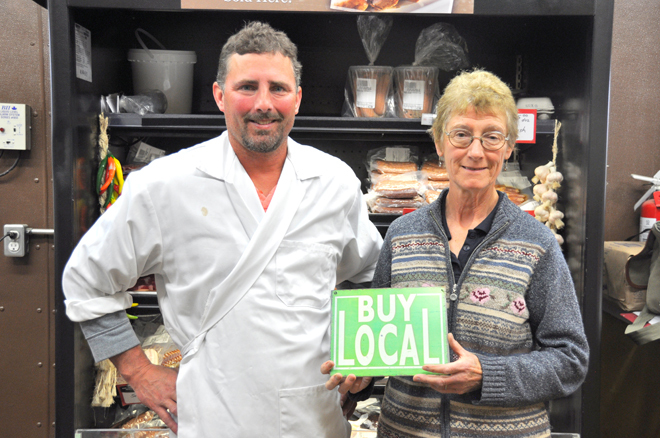 Ron Keely, owner operator, has been a butcher for 27 years. He bought the facility in Cherry Creek and added on 5,000 square feet, two cutting rooms, and a retail area. It’s a busy year-round enterprise with 15 employees, selling beef, lamb, pork, and bison, and attracting customers from places like Pemberton, Horsefly, Likely, and the Okanagan. The company also makes dog food. Kam Lake View Meats processes animals already sold to different outfits. “We process the meat, such as jerky, sausage, and steaks, and package it with their own labels,” says Keely. An office for the government inspector is present on every kill day. The company is A.W.A. (Animal Welfare Association) approved and held to high standards. The environment is conducive to calm and comfort, with natural soft bedding, a good roof over the animals’ heads, and roomy pens with high, solid walls. You can walk by the stalls and the animals don’t get spooked. In fact, care of the animals begins even before they arrive. Keely says he used to receive highly stressed animals, mostly from 4-H sales. “They went to the sale, were kept in a hot barn, and were very stressed,” he says. “Then they were prodded onto a double decker liner and brought to our plant. About eight years ago, Keely stopped accepting animals straight from 4-H sales, all piled in a truck together. He started asking that owners bring their animals to him individually a week after the sale, so they were less stressed. As a result, he rarely finds a dark cutter. Keely likes to get the animals the day before, giving them time to settle in and calm down. To him, a successful kill means no sign of trauma, taking place as fast as possible. “People care more about where their food comes from now, and appreciate being able to find quality, local meat from animals treated with care,” he says. “We have a lot of long-time customers and work hard to provide product they need. 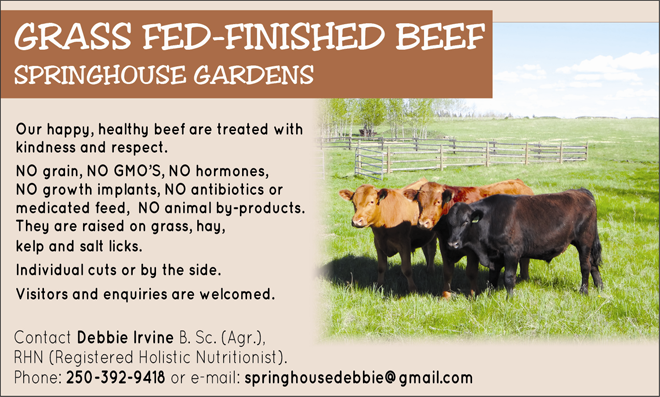 Debbie Irvine from Springhouse Gardens near Williams Lake has been hand-raising steers for meat since 2012 and says Kam Lake View is the natural choice for processing her animals. She had been around horses in her life, not cows. “Because I have some knowledge of natural horsemanship, I was able to view cattle with the same principles,” she says. With that in mind, Irvine makes a point of having her steers used to her, to the point where she can hand-feed them and give them a good scratch. When they see her out in the field, they don’t run away—they generally come up to her. Author Julius Ruechel explains in his book, Grass-Fed Cattle – How to Produce and Market Natural Beef that because cattle are not equipped to deal with a high-grain diet on a regular basis, their bodies cannot cope with the natural digestive toxins and high acidity of grain digestion. “In feedlot animals on extremely high-grain diets, the resulting stress over the long term is so high that their livers shut down, causing them to die sometime after their second birthday if they are not slaughtered before,” he says. Irvine’s steers are fed hay, and for treats they get hay cubes. They get grass in the summer and hay when grass isn’t abundant in the winter. There are absolutely no additives, hormones, pesticides, or GMOs in her beef because there is no grain. There are also no animal by-products and no feed medications. She explains that people who eat a lot of carbohydrates from grains tend to have health issues: high levels of inflammation, arthritis, diabetes, and digestive issues, and the same holds for beef that are grain-fed. “Because the cow’s liver is the detoxifying organ of the body, when it cannot properly remove toxins from the blood, these toxins circulate through the body and deposit them in the meat,” she says. Grass-fed beef is also free of glyphosate residues—glyphosate is the active ingredient of many Round-Up Ready crops such as corn, canola, and soybeans, to name a few. Corn and soy are commonly used in the diet for grain-fed beef and unless organic there is a high probability that they are Round Up Ready. There is more and more evidence emerging of the harmful effects of glyphosate such as cancer, neural tube defects, mood disorders, and autism. For more information visit https://www.westonaprice.org and type in glyphosate into the search box. It isn’t just what isn’t in the meat: it’s also what is. “Grass-fed beef converts grasses and other pasture plants to meat that will have the vitamins and minerals that these forages contain,” says Irvine. Animals on pasture are moving, unlike their feedlot counterparts, which basically just stand and eat, says Irvine, who adds that pasture animals have a better metabolism and their circulation is better, and that also makes for better meat. When Irvine first gets her calves they’re about six months old. Right away she makes a point of connecting with them several times a day to get used to her. “I quickly win them over when they find out I carry hay cubes in my jacket pocket,” she says. Raising her steers with such a caring heart, it makes sense that she wants humane treatment for them from beginning to end. LeRae Haynes is a freelance writer, song writer, community co-ordinator for Success by 6, member of Perfect Match dance band, and instigator of music with kids.